WayForward is coming with a follow-up to last year's Hey Ice King! Why'd You Steal Our Garbage? !, but it's not quite a sequel. 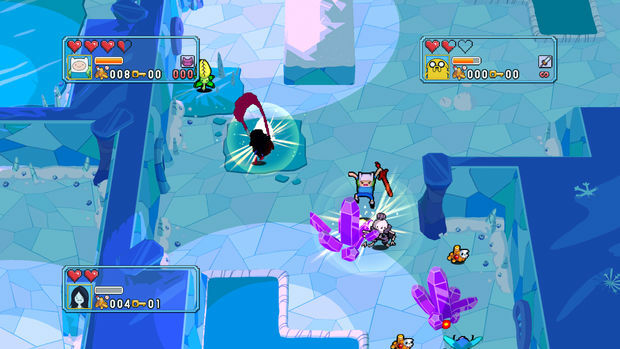 Adventure Time: Explore the Dungeon Because I DON'T KNOW is a multiplayer dungeon crawler and, in the brief hands-on I played, already is looking hotter than Hey Ice King!. Adventure Time creator Pendleton "Pen" Ward is still working closely with WayForward on this new project. In fact, it was Ward who both wanted both a different genre (compared to Hey Ice King! 's Zelda II style) and multiplayer. 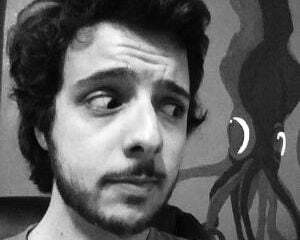 Ward is also penning a "huge reveal" exclusive to the game, which will later tie into the show. What it is remains a mystery, one likely hidden at the bottom of the Secret Royal Dungeon's 100th floor. I hope it's Beemo. Or sammiches. The courtyard of the Candy Kingdom serves as your hub in Explore the Dungeon. 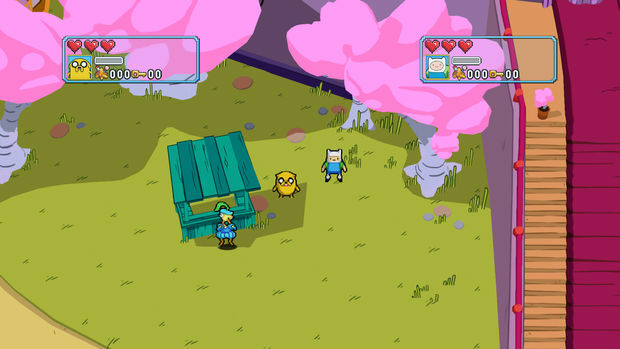 From there, you can interact with various Adventure Time characters, all of whom are fully voiced by the show's actors. I'm particularly glad that Choose Goose is the item vendor. Can't get enough Ed Wynn homages (related: Wreck-It Ralph is great). From the hub you can upgrade your characters' stats. Upgrading Imagination gives you more special move bars that you can keep stacked and stocked. You can also upgrade things like strength and health. Aside from that, you can talk to Princess Bubblegum to be allowed access into the Secret Royal Dungeon. Before entry, you can equip accumulated badges that offer various perks. As it stands, the four playable characters for Explore the Dungeon are Finn, Jake, Marceline, and Cinnamon Bun, though more will be announced down the line. Each character plays differently and has their own stats and specials. The aforementioned badges can also help shore up your characters' weaknesses. Marceline is the weakest of the bunch at two hearts of health, but she's also speedy and floats off the ground allowing her to bridge gaps and avoid ground-based traps. Her block also allows her to absorb red projectiles. On the other end of the spectrum, Cinnamon Bun is a four-heart-hoarding tank. Jake and Finn sit at three base hearts, while the latter has the ability to cross small crevasses. I played as Jake during the hands-on portion. His idle animation, with its flapping jowls, is painfully adorable. So to is his warrior-like running animation, furrowed brow and all. The game features some expectedly excellent pixel art and animation set against 3D backdrops. Jake's special move summons Lady Rainicorn, who speaks Korean and damages all enemies on screen. We went through a typical dank dungeon-looking stage, as well as an icy level. There will be six different types of floors and the floors themselves are partially randomly generated. Moderately sized, specifically designed squares of the map are put together for a slightly less random, but still varied experience. The experience is pretty typical as far as dungeon crawlers go, but the Adventure Time universe, characters and enemies, really help make the game shine. We gallivanted through stages beating up on familiar adversaries, picking up loot, and coming across great nods to the show. One of the enemies that shows up is the Hug Wolf; if it infects you, you'll be compelled to hug all of your friends should they get too near, briefly impeding them. Oh, and there are secondary weapons, including a cat gun. A cat gun. We polished off the hands-on time with a boss fight against the Demon Cat, whose voice and prose I was happy to be experiencing again. The Secret Royal Dungeon is home to the baddest of Adventure Time baddies, so there could be quite a few cool bosses. 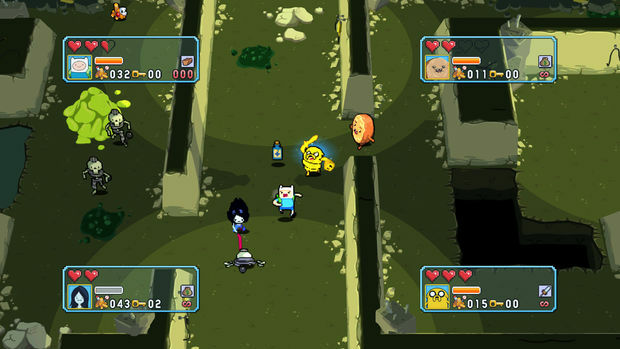 Adventure Time: Explore the Dungeon Because I DON'T KNOW is looking great. Feedback from Hey Ice King! (that the game was too short and could have used more work, for instance) has been taken into consideration, and the addition of multiplayer and different playable characters is the way to go. I'm quite looking forward to it.